"Please disregard the headlines that ran on Dow Jones Newswires between 9:34 a.m. ET and 9:36 a.m. ET," the company said in a statement. "Due to a technical error, the headlines were published. All of those headlines are being removed from the wires. We apologize for the error." 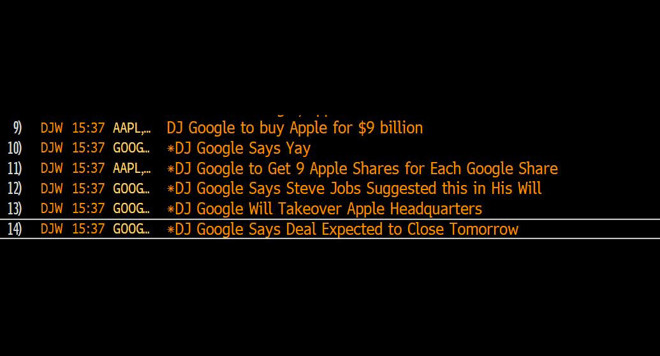 The headlines and their associated story were obviously fake, for instance claiming that Google said "yay," that it would "move into Apple's fancy headquarters," and that shareholders would each get nine shares of Apple stock. The story even suggested that Google would pay just $9 billion, when in reality Apple has over $260 billion in cash reserves alone. It's not clear where the content came from. Most likely it was test material that was accidentally pushed live. Apple's price on the NASDAQ notably spiked between 9:30 and 9:40 a.m. Eastern, leaping from $155.98 to $156.47. It began to crash around 9:55 a.m., bottoming out at $155.22 before recovering. Apple and Google have partnered in some areas but are also close rivals, competing in services, platforms, and more recently hardware. Google is on its second generation of self-designed smartphones, and Apple's Siri-equipped HomePod speaker will have to compete with the Google Home Max.